A divorce not only affects the spouses and children going through a divorce, but also the grandparents. For most people, a divorce does not wipe the “grandparent” title from a person. So, what rights do grandparents have to visitation of the children after a divorce? The Illinois Marriage and Dissolution of Marriage Act provides that third-parties, including grandparents, may request visitation time with children during and after a divorce. Depending on each situation, a grandparent may not be able to file a petition for visitation with a child. 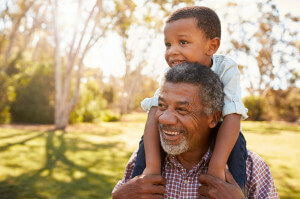 A grandparent may only file a petition for visitation if there has been an unreasonable denial of visitation by a parent and the denial has caused undue mental, physical, or emotional harm to the child. If a grandparent can show one of the divorced or separating parents has unreasonably denied visitation to the grandparent that caused the child harm, the court will consider multiple factors to determine whether the grandparent should have visitation, including: the wishes of the child, the mental and physical health of the child and grandparent, the length and quality of the relationship between the child and grandparent, and the amount of time requested by the grandparent. If you are a grandparent of a child going through a divorce and think you have been denied visitation with your grandchild, be sure to contact our experienced family law atorneys today to regain your visitation rights. Our attorneys service DuPage, Kane, Kendall and Will counties.